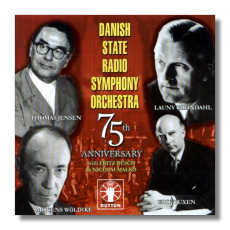 Mikhail Ivanovich Glinka: Overture "Ruslan and Lyudmila"
Ludwig van Beethoven: Suite "Leonore Prohaska"
The Danish Radio Orchestra is forever connected with the trail blazing première recordings of Carl Nielsen's symphonies, but here it demonstrates its active recording schedule in the late 40's and early 50's. Fritz Busch gives a wonderfully sunny performance of Brahms' Second Symphony, which throws in a particularly effervescent Allegro con spirito. Nikolai Malko is one of those underrated conductors whose reputation is only recently being reassessed. His 'Maskarade' overture is fiery and ebullient whilst he brings delightful potency to the rarely heard Galdslatten by Harald Saeverud. The Debussy Prélude and Stravinsky's short Suite are also winningly done. Issay Dobrowen gives a white hot rendering of Glinka's 'Russlan and Lumilla' whilst Launy Grondahl is represented by a deeply felt 'At the Bier of a young artist' and a swaggering 'Dream Pictures' waltz by the king of Danish salon music: Hans Christian Lumbye. Thomas Jensen enters the scene with two short Risaager works, the trumpet concerto with George Eskdale and the Little Overture for Strings. These two items have already been released on Danacord. It is left to Mogens Wöldike to conduct highly unfashionable but brilliant accounts of the Haydn 91st symphony and the Six German Dances, the latter are particularly wonderful to hear. The album ends with the DRSO wind ensemble playing Mozart's Divertimento #12 and a rare Funeral March from Beethoven's 'Leonora Prohaska' by Beethoven conducted by the enterprising Malko. Dutton's transfers are clear and solid whilst Lyndon Jenkins' notes are the usual model of clarity and entertaining information. Highly recommended as a pot pourri' of one of the greatest European radio orchestras.